When Kliff Kingsbury departed USC after a month as its offensive coordinator, sources told us he recommended the Trojans pursue North Texas OC Graham Harrell and they listened. TrojanInsider.com was told on Sunday Harrell would ultimately be the guy for the USC, but we hadn’t gotten any confirmation he accepted the OC job. Harrell was in Los Angeles Sunday interviewing with Lynn Swann and Monday night the extremely-reliable Bruce Feldman of FOX Sports is reporting Harrell has agreed to become the offensive coordinator as USC. Harrell will install an offense at USC very similar to what Kingsbury would have and he’s proven he can develop quarterbacks. Both Kingsbury and Harrell have worked for Washington State coach Mike Leach. If the Cougars can light up the scoreboard in the Pac-12, the Trojans should have no problem doing the same with the talent on their roster. 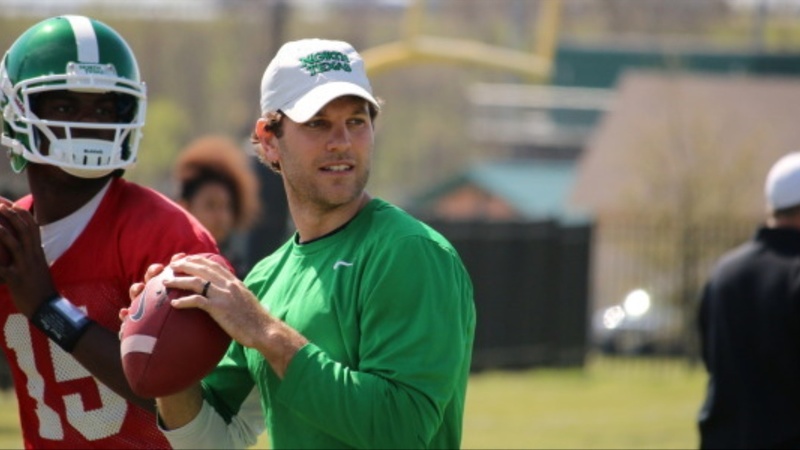 Graham Harrell joined the Mean Green as the offensive coordinator for North Texas prior to the 2016 season. His offense saw the 11th-best turnaround in the nation, scoring 9.6 points per game more than it did in 2015. North Texas threw for 771 more yards than it did in 2015, and the total offense gained 603 yards more than it did in 2015 under Harrell's guidance. Harrell, who was a record-setting Texas high school football quarterback at Ennis and in college at Texas Tech, spent two seasons at Washington State. He was promoted to outside receivers coach in 2015 and helped lead the Cougars to an 8-4 season and a berth in the Sun Bowl. Harrell coached wide receiver Gabe Marks, who was a Pac-12 first-team all-conference selection in 2015. Marks led the conference in receptions, touchdown receptions and was second in receiving yards per game. He set a Washington State single season record with 14 receiving touchdowns. In addition to Marks, wide receiver Dom Williams received honorable mention honors after hauling in 73 catches for 997 yards and 11 touchdowns. Washington State led the nation in passing offense in 2015, throwing for 397 yards per game. As a player, Harrell was a record-setting quarterback at Texas Tech, from 2004-08, under then assistant coach Littrell, finishing his career with an NCAA-record 134 touchdown passes, the second-most career yards (15,793) in NCAA history and with the third-highest career passing average with 350.96 yards-per-game. As a junior, the Ennis, Texas native, was an All-Big-12 Conference second team selection and Gator Bowl MVP, finishing the year with a school-record 5,707 passing yards, the second-highest season total ever in the NCAA FBS ranks, to go along with his 48 touchdown passes. In each of his three seasons as a starter, his passing yardage figures placed in the Top 25 all-time at the FBS level (21st in 2006 with 4,555 yards and sixth in 2008 with 5,111 yards). As a senior, Harrell was named AT&T's All-America Player of the Year, and was a First-Team All-American after leading the country with 5,111-passing yards while tossing 45 touchdowns and only nine interceptions. Harrell spent the 2010 season in Canadian Football League before spending three seasons (2010-12) with the Green Bay Packers, earning a Super Bowl in ring in 2010. Harrell earned his bachelor's degree in history in 2007. Harrell and his wife Brittney married in March, 2012.